There’s no question about it that couponing and saving money can make anyone happy. Knowing that you’re saving fifty percent or more on products for your family makes you feel great. However, we need to keep in mind that others have families that they are trying to save money for, too. For some, saving money like this is a necessity, while for others it’s simply a fun hobby. The TLC Extreme Couponing Show is not a good way to learn how to coupon. It’s entertaining, of course, but it isn’t reality. I’ll be honest. When I first started couponing I went after all the great deals I could find without worrying about what was left. I never cleared the shelves unless it was the last day of the sale, but I still bought in large quantities. Over the course of my couponing I learned that I don’t need all of that stuff and how to be considerate of others. I still find great deals, have a stockpile of items, and less stress. These are simply tips or lessons I have learned while couponing myself. To each their own, but I hope this helps with questions that I have been asked. 1. Do not let couponing and deals run your life. Do not let missing a deal stress you out! Yes, the deal may have been the best one that you have ever come across, but it’s not the only deal you will ever come across. Another deal will pop up around the corner. 2. If you don’t need it don’t get it. Just because an item that normally cost $5 now cost 25-cents does not mean you have to purchase it. That’s 25-cents, plus sales tax in most case, that you’re spending on something you will never use. 3. Peelies/Shelf coupons are put out by manufacturers. It’s okay to grab some of those, but don’t be a peelie thief. Keep in mind that other people may need/want to save on that product as well. Some peelie coupons are now invalid unless a cashier removes them due to this being a huge issue. 4. Sticking to the limits on coupons and products. Many coupons now state a limit of how many identical coupons can be used on a shopping trip. Many stores have set limits in place. This is to keep the shelves stocked so everyone has a chance to grab whatever great deal there is. Plus, most stores will have similar promotions at the same time. Shopping at different stores will help you get more of whatever the product is that’s on sale. Personally, I will do this week to week until my shelf that I keep extra products on is full. I will stop couponing for months and then resume when those items get low. During the time that I’m not couponing I don’t purchase any newspapers. There are a few exceptions if I know of a really great deal coming out, but otherwise I leave it alone. Groceries are a little different since I don’t use too many coupons on food products. I simply create a meal plan, purchase items on sale in bulk, use store rewards, and coupons when available. Additional tip: If you can use different brands this works out great. For example: I will purchase 2-4 of a product one week and then 2-4 of another brand on the next promotion. This builds my stockpile and I don’t need to buy very many newspapers. 5. This goes along with 4. I found that purchasing just four newspapers each Sunday gives me plenty of coupons. Newspapers and coupon inserts cost money. The point in couponing is to save money, so watch the outgoing cost involved. For me, with my four newspapers and printable coupons, I’m set on getting the good deals that my family needs. However,you may need a few more if you have a bigger family. 6. Coupon fraud is not a way to save. Most of the time people are not aware that what they are doing is illegal. It is illegal to purchase coupon inserts or to sell them. It states on coupons that they are not to be bought, traded, or sold. 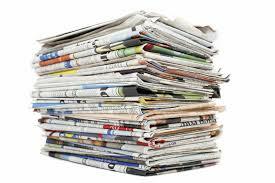 Newspapers companies are not allowed to sell the inserts without selling you the newspaper or they could get a huge fine. Most newspaper companies will shred any left over inserts. Some may give them to people, but they cannot be sold. Some coupon clipping websites have been shut down or sued. Basically, anything done that goes against the coupons terms and conditions is considered fraud. A simple way to save on your newspapers is to use store rewards. Rite Aid Ups cannot be used to purchase newspapers. However, CVS extrabucks and mperk rewards at Meijer can be used. Avoid spending tons of money on the outgoing cost of coupons. As mentioned above just stick with a few newspapers a week and to help cut that cost, use your store rewards. You can check out my page about keeping cost low while printing coupons over here. ← Tide: Stock Up Time! Get Tide For Just 89-cents each, Plus Free Crest Pro Health Mouth Rinse, Dawn, and Bounty! (starting next week)!